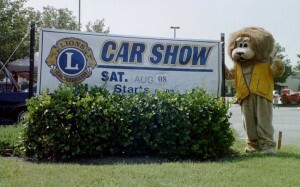 On August 8th, I had the opportunity to visit with the West Knox and Farragut Lions Clubs for the first time as they conducted a joint Car Show fundraising project. 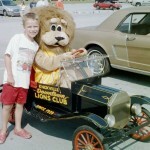 By the way, you can visit the West Knox Lions Club web site here. 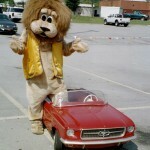 I don’t think the Farragut Lions Club has a web site. I didn’t have room for all the photos in this post, so go to the photo album for more! 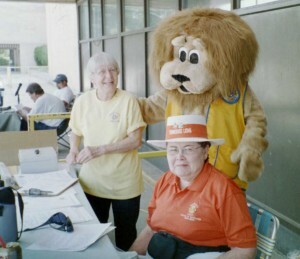 I tried to register at the check-in table with Lions Shaaron McFarland and Nancy Hall, but had difficulty writing with my paws. Fortunately, I later realized the registration was for cars anyway! 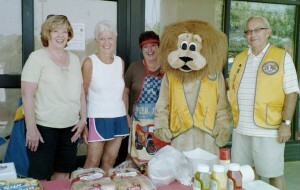 It didn’t take long for my nose to lead me to the refreshment area staffed by the Farragut Lions Club! 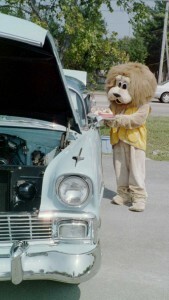 Lion Norvell Burrow was handling the grill and I really wanted to help out, but I was plenty hot enough without being near the charcoal. There were some intersting cars at the show. This is the closest I’ve ever been to a Rolls Royce. You don’t see these cars very often! Here’s one that was staged just like a drive-in movie with the speaker in one side, tray of food on the other side and a child with a bucket of poporn in the back seat. There were two mini cars at the show: a Model A that used to be used by the Knoxville Downtown Lions Club in parades (now part of the West Knox Lions), and a Mustang. Eventually the two cars raced around the parking lot; of course, the Mustang won! Congratulations, to the West Knox and Farragut Lions Clubs. It was great to see two clubs working together this way! 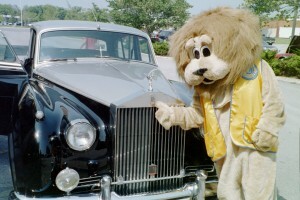 Check out my photo album from the West Knox – Farragut Lions Club Car Show.